Trail is snow-bound in the winter, and downed-trees can make travel unpleasant until crews get a chance to clear them, usually by mid June. The IMBA EPIC South Boundary Trail begins at the El Nogal Picnic Area on US Highway 64 (~3 miles east of Taos) and ends on FR 76 close to Angel Fire. There are a few popular rides and several burly loops that incorporate the South Boundary Trail—though most people ride it from east to west, either starting at Garcia Park (40-minute shuttle from Taos) or doing the full ride from FR 76 near Angelfire (1 hr shuttle). This direction offers more downhill and smoother climbs. The "full" SBT starts from FR 76—a washed-out, rocky access road best tackled in someone else's vehicle—and begins with a 1.5-mile, 800-ft rocky loose climb that may require some hiking. From Osha Mountain, the trail descends a loose road for less than a mile before entering the "Heaven on Earth" section: a consistent flowy classic side-hill singletrack descent through conifer forest and aspen groves. Then wipe the grin off your face with the 1.5-mile, 350-ft climb to Garcia Park. At Garcia Park, the trail follows the road briefly before cutting right across the field and back into the forest where a series of old two-track and singletrack connectors weave westward. Route finding skills are important there are lots of unmarked turns, old roads, and meadows where the trail isn't well developed. The trail eventually continues it's side-hill traverse / descent through aspen and conifer forests that are even more stunning in the fall. SBT loses most of its elevation in the last 5 miles, with the steepest and most technical bits thrown at you in the last 3, known as the El Nogal section. This challenging final descent is fast at times, loose at times, stair-steppy at times, scary at times, and exceedingly fun (at times.) Many riders will feel more comfortable walking through the tricky bits. This ride is normally done as a shuttle; some ride it as an out-and-back from Taos in a long day. There is no potable water on the trail, so bring plenty, and watch out for afternoon thunderstorms during summer. ~20 downed trees. Many could be ridden around. Still a good time. Fantastic ride. Loads of downed trees but all can be hopped/walked over or around. Gearing Up helped with a Beast of a rental and Turquoise Tours for the shuttle. It's a tough climb but you're rewarded with some amazing views. 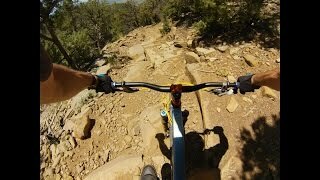 The intitial climb up Osha pass is pretty rocky/babyheads, after that this trail is sweet! What a ride! I'm out of shape and absolutely not acclimated to the elevation. 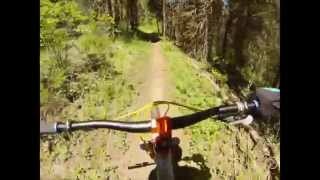 This trail rocks. Corner Park on a dry bluebird day. Afternoon air on the South Boundary Trail. Appreciating the fiery fall colours of October. "Heaven On Earth" portion of South Boundary Trail. View looking SSW as you begin the first decent. SBT overlooking town of Taos!